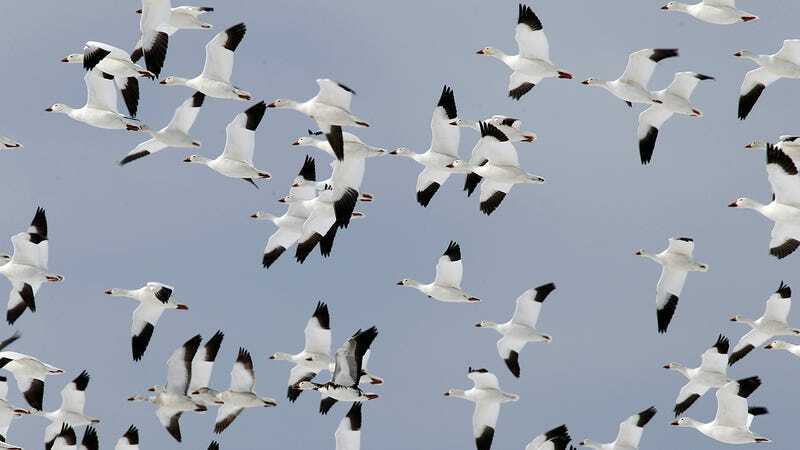 Last week, thousands of snow geese died in Montana after landing on “the acidic, metal-laden waters of an old open pit mine” to escape a snowstorm, the AP reported. Montana Resources, the mining company in charge of the toxic water, told the Billings Gazette that the agency won’t release the exact number until mid-week, but it estimates about 10,000 birds perished on the evening of November 28. “I can’t underscore enough how many birds were in the Butte area that night,” he said. “Numbers beyond anything we’ve ever experienced in our 21 years of monitoring by several orders of magnitude.” Usually only 2,000-5,000 birds fly over Butte throughout the whole year. So what caused the snow geese to fly into contaminated waters, ultimately leading to their untimely and tragic death? University of Montana-Western ornithology professor Jack Kirkley told the Montana Standard that climate change likely played a role—with milder winters, birds migrate south later than they once did. As of Monday, 50 snow geese remain in the pit, still alive after residing there for over a week. The exact cause of death of the other (less fortunate) geese is yet to be reported. In 1995, however, 342 snow geese died because they ingested the pit water, which contains sulfuric acid. “Necropsies also showed that those birds had high levels of heavy metals in their kidneys,” the Billings Gazette reported. Montana Resources faces fines if the Environmental Protection Agency finds that the company did not comply with its codes. Rest in peace, sweet birdies.